Here is my piece for the September Mind Wide Open Challenge. If you have not been over to check out this site, it is just awesome! The voting will begin on the 7th and I can promise you mind boggling artwork. I love participating in this challenge, because it is that, a challenge! 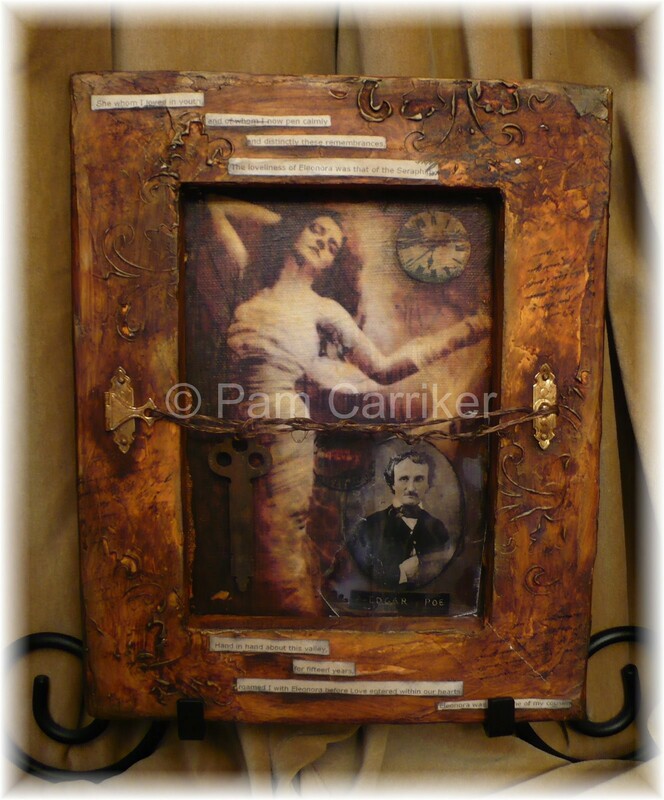 I used the lovely image that Gail provided and collaged some additional elements to pull it into my current Poe theme. I used an 8×10 canvas that has been turned over using inspiration from my friend Glenda of Twocooltexans. 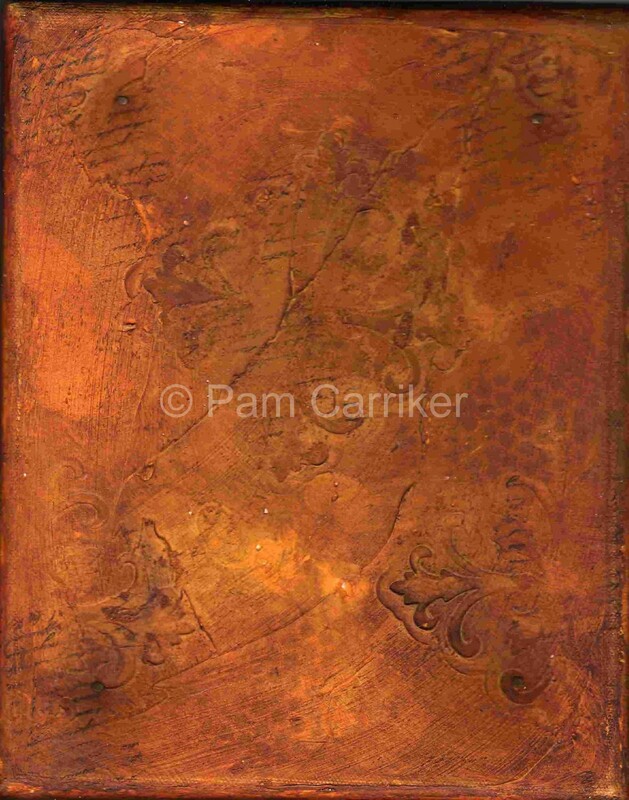 I have covered the whole thing with molding paste and pressed stamps into it to give it texture and a design. It looks like tooled leather. Layers of paint and inks were applied and then I added some extra elements, mica, wire, key, hinges and nails. The back is completely done, making it perfect for displaying on an easel. Our word prompt is ‘Boo’, and though I did not use the actual word on my piece, I can think of nothing as spooky as some of Poe’s writings. So my ‘Boo’ is implied here, just listen to the beat of your Tell-Tale heart. These words are from Poe’s work, Eleonora and read, “She whom I loved in youth and of whom I now pen calmly and distinctly these remembrances. The loveliness of Eleonora was that of the Seraphim. Hand in hand about this valley, for fifteen years, roamed I with Eleonra before love entered within our hearts. Eleonora was the name of my cousin.” I have titled it simply, ‘Eleonora’. Pam I thought your entry was beautiful. Congratulations on your win. Love your take on this piece..very elegant and such neat techniques! Good Luck! Your entry is absolutely stunning. Love this technique also. You’ve done a beautiful job. Good luck! Your entry is breath-taking! Love the techniques and colors you’ve used! What a gorgeous piece of art again, Pam! So wonderful! Beautiful entry, Pam! Thanks for sharing your process and techniques. I feel inspired by your post and artwork. You have a special gift. This is amazing, I love all the texture, and how you incorporated Poe into the theme. Damn but you are good (oops…am I allowed to say that word?!?!) — you know what I mean — I was joking on creative souls about you angling for first place but you always seem to grasp the mood and the feeling and then create a piece to go with it — and each time you’ve done something completely different. A.M.A.Z.I.N.G.!!! Fabulous work, Pam! This piece is gorgeous! Pam, it looks so good. I almost joined that challenge myself. One of these days….Thanks for writing me and thanks for the credit. You are such a sweetheart. This is so gorgeous!! TFS! Stunning piece – luv the rich colours. this piece is so totally cool…you have such a gift. I think if time permits I may enter something in this challenge too….key phrase…if time permits 🙂 But even still…. I’m voting for YOU !!! You MUST win this…it is stunning! I absolutely love this entry and wonderful artwork. I didn’t realize that’s how Glenda creates some of her pieces–love that idea! Love your technique with stamping into the paste. It really adds a fabulous overall dimensional quality 🙂 Great work, Pam!